Flock of birds. Credit: Wikipedia. 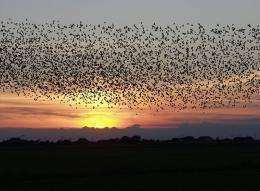 (PhysOrg.com) -- An animal group such as a school of fish or a flock of starlings can seem like a single entity governed by a collective mind. A new mathematical analysis of flight dynamics in flocks of starlings suggest this is because the birds are effectively a single network, with every bird’s movements affected by every other bird’s movements, as if they were all connected together. The phenomenon adopted by the flock of starlings (Sturnus vulgaris) is called “scale-free behavioral correlation,” which occurs outside of biology in events such as an avalanche or the formation of crystals, both of which are critical systems in which nearly instantaneous transformation can occur. When a starling flock acts as if it were a single entity it is acting as a critical system and is also optimizing its collective response to challenges such as a predator attack, according to theoretical physicist Giorgio Parisi and colleagues from the University of Rome. who carried out the study. 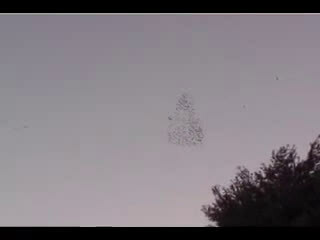 The researchers studied flocks of starlings over a major winter roosting site in Rome, measuring the 3D positions and velocities of individual birds. The flocks of birds spent their days in the countryside and returned to the city before sunset, performing aerial displays before they settled for the night. The displays appeared like an aerial dance in which the flocks moved and swirled together. The researchers used stereometric digital photogrammetry and computer vision techniques to reconstruct the 3D positions and 3D velocities of the individual birds in the flock from the consecutive shots of the flock, which were taken at 10 frames per second. (A) The 2D projection of the velocities of the individual birds within a starling flock. 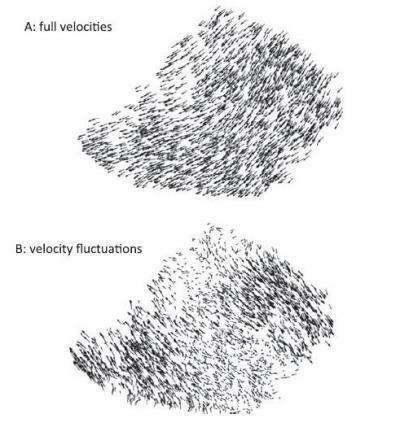 (B) This is the 2D projection of the individual velocity fluctuations in the same flock at the same instant of time as in A (vectors scaled for clarity). Large domains of strongly correlated birds are clearly visible. The flocks ranged in size from 122 birds to 4,268, but the size of the flock made no difference to the way they moved. In every case if any one bird turned and changed speed, so did every other bird. What was most surprising to the scientists was the near-instantaneous signal processing speed. How the birds achieve this feat is a mystery. The synchronization of speeds and orientation is found in critical systems. An example cited by the researchers is ferromagnetism, in which particles in a magnet display perfect interconnection at a specific “critical” temperature. Physicist Irene Giardina, one of the study’s co-authors, said the results suggest starling flocks behave as critical systems “poised to respond maximally to environmental perturbations,” but she said more analysis would be needed to prove this definitively. The behavior of the flock of starlings is different to the behavior of a group following a leader. Such a group would move in the same direction and would appear strongly ordered, but there would be no passing of information between individuals and so behavioral fluctuations are independent, with changes in direction of an animal other than the leader having little effect on other members of the group. The starlings’ behavior is an example of self-organization, and the collective response to events such as attack by predators gives them a distinct advantage. The paper is available online from the Proceedings of the National Academy of Sciences (PNAS). the problem with science in the modern era is that they produce so much information and pile it for someone else to use, that they lose their own discoveries, and waste tax money (Rather than their own or some from an earned source), trying to discover the same thing over and over. Russia could ahve had stealth technologies in the 70s. they didnt bcause their scientists papers seldome went anywhere. so it took a western entrepreneurial scientist (worked for a profitable company seeking profits), to read russian papers. I can fully agree with this stance. Every scientist, who is presenting redundant research for public money should be punished. I have noticed this for over 30 years from simple observation. This is not news. I wish they had delved into the psychic connection between the birds. It's remarkable to see them all in the tress cackling then they all stop simultaneously and ascend together as if guided by a psychic force. There's nothing "psychic" ("a person [animal?] apparently sensitive to things beyond the natural range of perception; outside the sphere of physical science") about it. The bird SEES/HEARS left and SEES/HEARS right and moves according to its neighbor. Why does this have to be some spooky psuedoscience? The amazing aspect here that seems to have eluded everyone is the rise of order from chaos. While, granted, I agree with Art, this almost exact same article was published just a few months ago... And many similar (ants, bees, sand, slopes) crop up often. This research is important because it has univeral underpinnings. Much like "Conway's Game of Life" each "unit" of the matrix of our fabric of reality is "programmed" which certain behaviors to respond to certain conditions based on its surroundings. From what would be individually random chaos rises a systematic order that we call the Universe. Except for those events where entire groups seems to "break off" independently and spontaneously. How is that explained in this scenario? For my 3D graphics class, we had to model boid flocking behavior. Each boid was influenced by surrounding boids, but only at a certain distance. Each flock member had sub-flocks. This could explain how they "break off." Perhaps there weren't enough nearby flock mates to influence strongly enough the current heading of the ones who broke off to stay together with the main flock. This forms a new flock which should continue to flock together. Nothing "supernatural" about it. "Cell disassociation" is a macroscopic effect from microscopic causes. Smaller waves building to form bigger results. doo doo doo doot who ya gonna call? boidbusters!